That photo of Anouska making a phone call works for me! Unlike those sad, humorless cases on facebook. If that's the S.H.A.D.O. facebook group, then that'll be Her Holiness the Reverend Lightcudder who's exorcising the satanic and unholy images you've posted. But it's OK for her to post her own fantasy images of a starkers Ed Straker on her nutty website. This one was posted my someone who suggested that her name might be 'Minty Cameltoe'. Which I'm fairly sure is incorrect! Have no idea of the actress's name, although she does appear in one or two episodes and gets a line or two of dialogue (which makes it all the more unusual that she is not credited). Can't help wondering if there was something going on between Joan and, er, Gay. Add to this the black and white pics that I posted earlier... a shame this was not explored in an episode. And I love this photo of Gay. 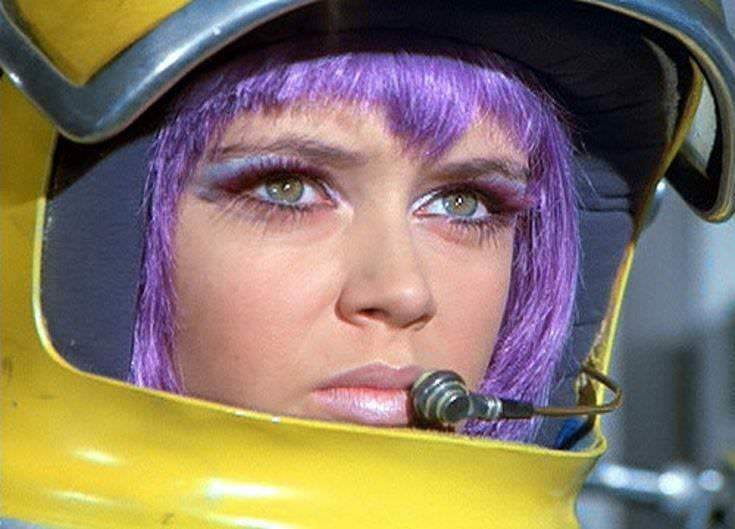 I am particularly impressed that she kept her purple wig on inside the space helmet. Seriously, a great pic. Just goes to show that you don't need T and A to look damn hot! 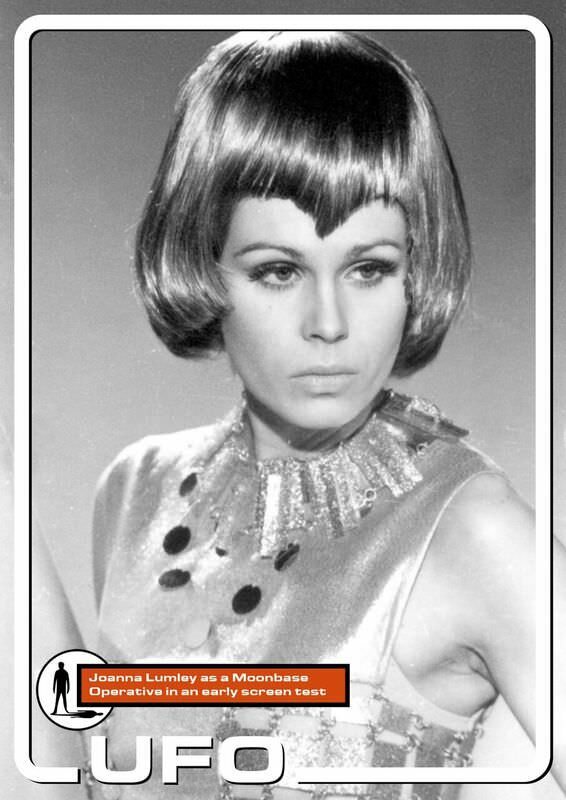 I think it's in the Fanderson Club's documentary on the making of UFO were an actress who played a "Moonbase Girl" talks about the outfits they wore. She didn't mind them and neither did the other women. She quipped that they were all young and had great figures and found the outfits flattering since they displayed their figures so well. Yeah, Dolores Mantez. Sadly no longer with us. Ayshea also has a laugh about the outfits in the Network documentary and also makes it quite clear that she is rather pleased with the posterior shot and that it was used as the opening to the first ep. All these militant offendees on the SHADO facebook page are just making themselves look silly! Thank you fordcapri. I didn't have my copy of documentary handy to check. 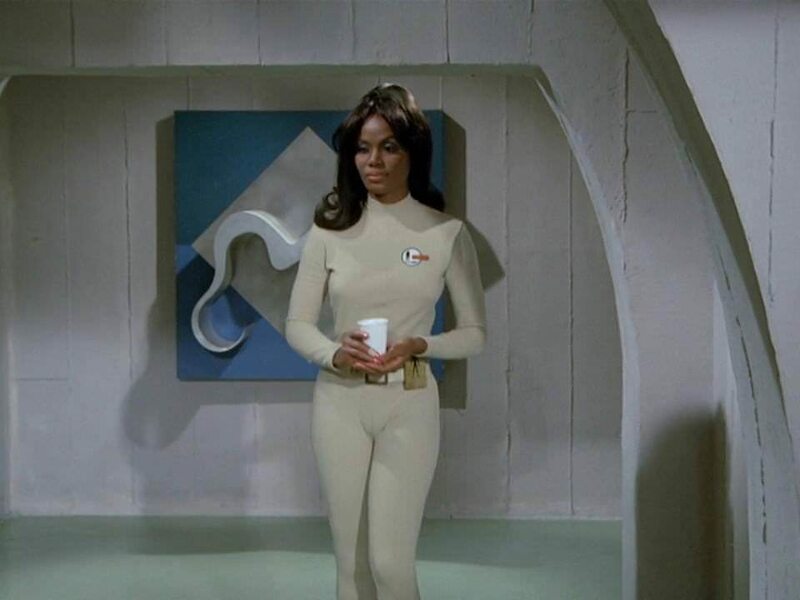 If the women involved were not bothered with what they wore on UFO nearly 50 years ago and are not bothered by it now then no one else should be. 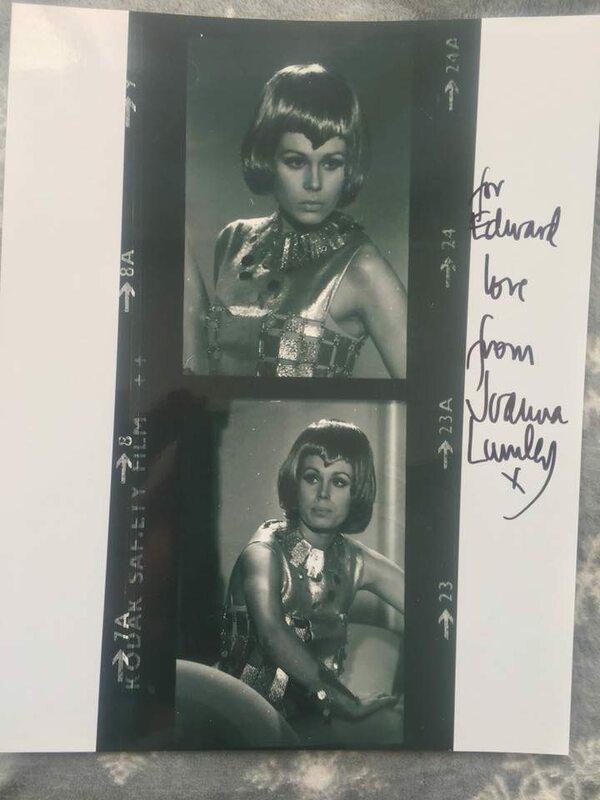 These photos, showing that a certain miss Joanna Lumley had screen tested for UFO had been seen by no-one since 1969, until they were discovered in a box in 2016. One of them was printed up as a postcard and given away with the UFO bluray set. It seems that someone has already managed to get her to sign some! Some good calls there DS but I did think Adrienne was a bit too old at 38 (says the 56-year-old man ). I thought Adrienne was nice for an older woman. There was also Suzanne Neve in 'Confetti Check A-O.K.' and 'A Question of Priorities'. I thought she looked good in her Randall & Hopkirk (Deceased) episode. Less so in here UFO one. Who had these 'U.F.O.' Dinky toys in the early 70s? I did. Wish I had kept them now. I could never work out why all the original Dinky Interceptors were painted green and not white. To (sort of) return to topic, I couldn't ID Anouska Hempel, Dolores Mantez or Gabriella Drake in that era, though I did have the green Shado 2 tank as a childhood toy. IIRC it used to fire yellow pellet-type things from its turret. You used to lose them behind the settee etc, and I think nowadays they would be considered hazardous. ...and am enjoying looking at the pictures and reading the comments. Which reminds me; when I first met Georgina Moon - back in 2014, I think, - I got her to write 'Checking boosters' on her signed photo! Sad but true. Lovely woman. Got the Shado 2 and the Interceptor. Which is a bit odd because I didn't really like the show. That is possibly the reason why both are still mint in box! Although the Interceptor isn't exactly a box. I'll have to get them on eBay one day. I resumed watching UFO following the U.K. Premiere Order. Number 14 in that order is THE PSYCHOBOMBS. This episode was made as part of the second production block and is one of two not to have the usual opening title sequence and theme music. Confetti Check A-OK is the other episode and apparently some home media releases added the usual opening. A Ufoe lands in England and transforms three ordinary people into super powered super weapons. The three people are played by Deborah Grant, Mike Pratt and David Collins. An interesting touch in the story is that the Aliens warn SHADO of their impending attacks against them but not how the attacks will be carried out. Much like the Mysterons do with Spectrum in Captain Scarlet and the Mysterons. The story adds another layer of mystery to the alien threat, includes the expected excellent model work and special effects as well as good performances from the three guest artists. Pratt is particularly effective without uttering a word. Something interesting about this episode is that both Colonel Lake and Paul Foster carry some sort of official ID that they show to people. Obviously it couldn't mention SHADO but it's never made clear what it identifies them as a member of. SURVIVAL. The fourth episode in Production Order and the first episode Michael Blllington made. It was shown fifteenth in the U.K. Premiere Order and kind of gives the mpression that everyone in SHADO gets a turn to command Moonbase when viewed in that slot. The DVD understandably puts Exposed before this episode but that makes it seem like Paul Foster goes from a new recruit to head Moon Base in a very short time. An attack on Moon Base leaves an astronaut dead and Straker wants to try and recover the intact Ufoe on the lunar surface. Foster leads a small team to locate and recover the alien craft. After an attack Foster is believed to have been killed and his communication equipment damaged. Now he has to make a desperate attempt to reach Moon Base before his oxygen runs out. To avoid Spoilers for anyone who hasn't seen this, my description of the plot is extremely brief and leaves out crucial story points. The thing that has always stuck with me over the decades about this episode is the funeral service for the astronaut whose body is launched into space in a rocket. During this scene Foster states that the year is 1981. MINDBENDER. The next to last episode to be made as well as one of the later episodes that really pushed the boundaries of what the show could do. It is also one of the best episodes. A Ufoe mysteriously blows up near Moonbase. One of the men investigating the wreckage finds an unusual rock that he takes back with him. Contact with the rock causes him to experience vivid hallucinations which makes him feel threatened and he lashes out violently. He is only the first to have his mind bent by the rock which soon ends up at SHADO HQ. The editing in this episode is excellent in the way the hallucinations are depicted and the reactions of the people involved are shown. I am reluctant to comment much more to avoid spoilers but will repeat that this is one of the BEST episodes of UFO. Anouska Hempel being in it doesn't hurt either. As a kid I was inspired by the plot to have my Star Trek action figures encounter a strange rock that caused hallucinations. It’s one of my favourite episodes of any show, not just UFO. A brilliant idea and good use of the studio. That's a bit over $11,000 US Dollars. For that kind of money the d*mn thing better function as a rifle. FLIGHT PATH. The episode with George Cole and the third one to be made. He plays a member of SHADO named Roper whose role in the organization is never specified but he knows a lot about S.I.D., wears civilian clothes and has been a friend of Alec Freeman for years. For the part Cole wears a wig that makes Roper look like he uses the same barber as Marty Hopkirk. The aliens are blackmailing Roper into providing them with information. When Roper is exposed SHADO races to determine how the aliens plan to use what they learned from Roper. Roper is given an extremely risky chance to redeem himself. I wouldn't say this is one of the best episodes but it is very good. George Cole delivers a top performance as the conflicted Roper and there is some fine moments of characterization for Freeman and Straker particularly in the way Freeman helps to balance Straker's harder edge. ORDEAL. Paul Foster is captured by aliens when they attack a SHADO health farm. Can SHADO rescue him? Another very good but not great episode. I always feel the ending is a real letdown with his one. A real kop out. Great to hear 'Get Back' by The Beatles at the "groovy" party that Foster attends with his new Mk II rug. Yeah, the ending is lame. Thanks for reminding me I forgot to mention 'Get Back' and that Sylvia Anderson appears as one of the party goers. I was just thinking that the story in Ordeal could have been used as part one of a two part story with Kill Straker! as the second half. Both episodes would be slightly different if that approach had been taken. IIRC they received the princely sum of £50 as a one off payment for the use of Get Back, likewise for the use of All You Need Is Love in Fall Out, which was only possible because Lew Grade owned Northern Songs, The Beatles’ publishing company for post-66 material, at the time. It was this portfolio that was later sold to Michael Jackson. I suspected that was the reason they used 'Get Back' in the episode. 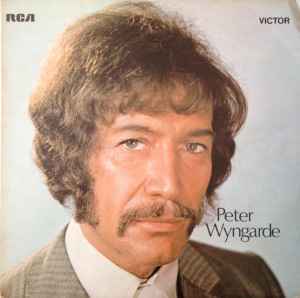 I didn't realize Grade owned Northern Songs that early. This Forum is highly educational. felix - ATV Music (i.e. the Grade organisation) bought Northern Songs in 1969. Therefore, ATV would have owned the rights to 'Get Back' when used in U.F.O. but not the rights for 'All You Need Is Love' when used in The Prisoner (1967)? The Prisoner episode in question ('Free For All') was, IIRC, filmed in early 1968. Not that makes a lot of difference if Grade didn't buy Northern songs until 1969! I've read that,John Lennon was a fan of The Prisoner and since he wrote All You Need Is Love maybe that had something to do it being used so cheaply. Timelash-one of my favorite episodes. I see Chris Bentley's book on the series has finally been republished and now back on sale. That has taken 2 years!